Lots of coffee-roasting at caffe d’bolla as always. 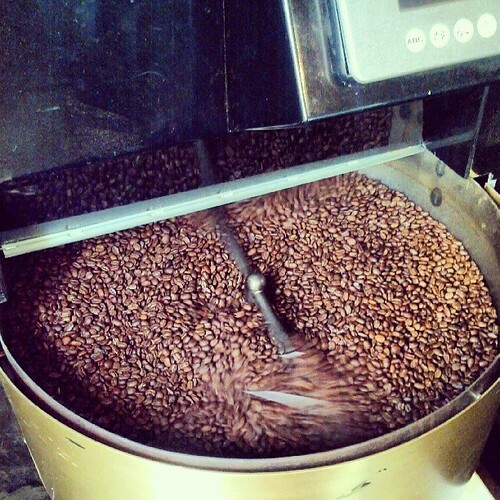 One of the Single Origin Coffees that just came out of the roaster is Guatemala Antigua Finca Cabrejo. On the journey down from Antigua to Guatemala City, a brick wall with sign in gold lettering reading “Cabrejo” marks the entrance to the home of Agustin Fashen, and the road that leads to Finca Cabrejo. The farm ranges from about 1500-1900 masl, and consists mainly of Bourbon and Caturra. They use a wet processing method. In the cup it’s malt sweetness with hints of almond up front which opens up into an malic fruit sweetness – white nectarine, red apple, and pear as it cools.